Which tea region do you most associate with? Are you a bold Assam character? Are you more gentle like a Darjeeling? More forgiving like a cup of tea from the Nilgiri region? Something to think about as you brew that magical cup of Indian tea. I’ve traveled a good bit over the years touching down in places like Southern Africa, Malaysia, Thailand, Hong Kong, China, Japan, Europe, Mexico and the Caribbean and now it appears that I will have the pleasure of visiting India and Sri Lanka. I am thrilled! Having been invited by Pearl Dexter, Editor of Tea. A Magazine to join her and 6 others for a private tour of the tea estates and gardens in both countries, I must say the excitement is hard to contain. Those participating in this wonderful tour include: Pearl Dexter; Cynthia Gold, Tea Sommelier, Boston Park Plaza Hotel; her husband Julian; Danielle Beaudette, Owner/The Cozy Tea Cart; Judy Larkin, The Larkin Tea Company; Carol Sims, Tea Embassy; her husband Bob; and myself. I am so looking forward to exploring the estates in Sri Lanka and the Nilgiri region of Southern India.Though the idea of a 24 hour flight out of JFK less then thrills me, I’ve no doubt what awaits will be magical. I can’t wait to sip of cup of freshly produced tea! Our group will leave the US on April 16th and return on the 25th. My hope is to blog, twitter and facebook while I am there, but that will require the leap over to AT&T and the wonderful iPhone. I cant wait! Nilgiri: South India’s Nilgiri means “blue mountain.” Started in the 19th century. 2nd largest tea producing area after Assam. Especially teas produced in altitude regions of over 1,600m surrounded by plants like eucalyptus or cypress trees, are known internationally as “fragrant teas” and highly recognized by their special flavors. Sri Lanka: Ceylon tea from Sri Lanka, is considered the best tea in the world. The influence of climatic conditions of its plantation imparts to the product a variety of flavors and aromas, synonymous with quality. Why is Ceylon Tea considered unique? The diversity in flavor – something that other tea producing countries do not have. Teais = grown in six agro climatic regions, each region giving its own flavor profile to the tea grown in it. There are six regions for tea in Sri Lanka: Uva, Nuwara eliya, Udapussellawa, Kandy, Dimbulla and Ruhuna. The tea sectosr in Sri Lanka have always been a vital component of her economy. It is also the country’s largest employer providing employment both directly and indirectly to over one million people. It also contributes a significant amount to Government revenue and to the gross domestic product. As a self proclaimed “tea snob” sometimes its hard to wrap my hands around a trendy blend. Especially some that are just… the oddest of concoctions. I’ll refrain from mentioning anything specific, but one that comes to mind is a tea with so much strawberry in it I dumped it out immediately. It wasnt tea, it was Strawberry Quick! With just a touch of local honey (buy local!) to boost the chocolate flavor – you’ve got yourself one of the best secrets out there! Rich, smooth and creamy it reminded me of sitting fireside in Vail … watching everyone ski and snowboard into each other. Do you have a chocolate addiction? Consider yourself a choco-holic? Like a chocolate-y snack around midnight? Try chocolate tea to satisfy the craving. I highly recommend this wonderful, surpising tea as a way of enjoying chocolate and tea without… consequence. (ie: calories). 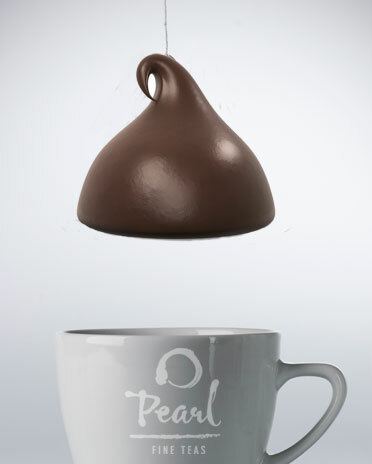 *** If you contact me directly (info@pearlteas.com), I’ll send the first 10 TeaPeeps a sample of our newest member to the tea family: “TeaChocolatte”. In the subject line put: “TeaChocolatte, please!” and let me know if you found us via Twitter or the TeaLove Blog! and don’t forget your mailing address!